Check out the sections below to find out more information about the special in-museum programs, partnerships and outreaches that we’re working on. With the help of local and national guests, we have been able to expose our audience with a diverse assortment of highly skilled makers. Guest Makers work alongside children and staff in a creative environment to show off and teach visitors about skills, tools, processes and creations. The Museum has partnered with the Maker Education Initiative to host and train four Maker Corps leaders for several years. College-aged makers work alongside MAKESHOP’s Teaching Artists to develop strategies for brining making to the rest of our community. 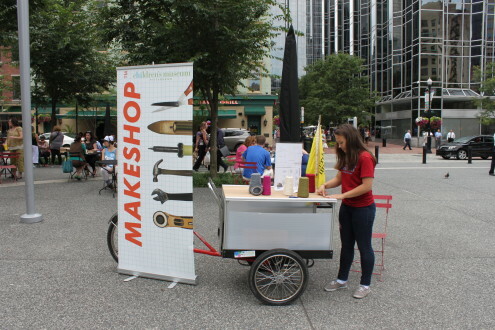 In 2013, Maker Corps leaders conducted a “Summer of Making” Pop-Up Program in Pittsburgh and West Virginia, with a mobile “street team” showing up at events and public places to provide brief, engaging making experiences for children, families and adults. In 2014, two new Maker Corps Members worked with the Pittsburgh-area MCMs at local maker space Assemble and Millvale Community Library. 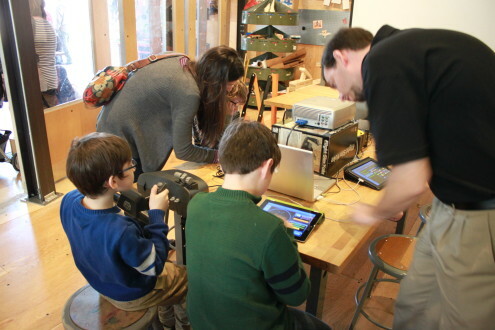 MAKESHOP is a site for non-profit and for-profit organizations, companies and individuals who are interested in playtesting and prototyping with children and families. Playtesting is iterative testing of a designed experience with its intended audience. Playtests are done to determine if the design supports the types of experience for which it was designed; to discover unforeseen features of the experience, including interactions, problems and opportunities; to be surprised and have many “ah ha” moments; and to iteratively modify the design to improve the users’ experience. 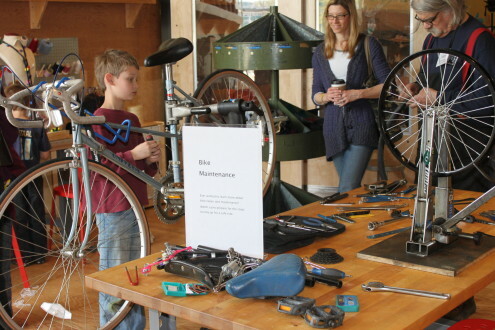 Maker-related programming are also incorporated into the Museum’s Youth Programs every year. 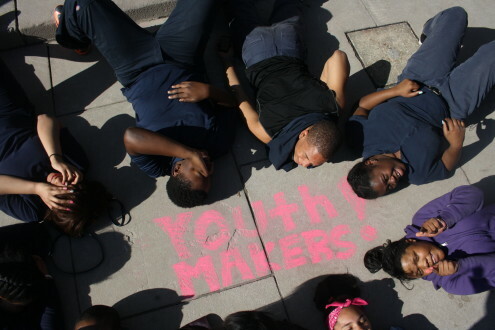 In the past, students in the Museum’s after school program YouthALIVE! (ages 11-18) explored MAKESHOP on a weekly basis, actively engaging with open-ended DIY and workshop-style design activities including sewing, woodworking, and electronics. With funding from Cognizant, we also partnered with another local maker space, Assemble, to provide twice-a-month Youth Maker Nights, one at each site. 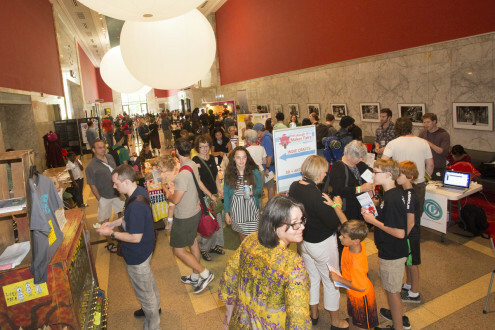 The Museum hosts this annual, family-friendly community festival each year to celebrate making, with projects of many kid and adult makers and attracting thousands of attendees, many of whom had never visited the Museum before. Maker projects range from robots made by middle school teams to soldering, cuddly circuitry, floating origami and 3D printer demonstrations. Learn more about the Faire at the Maker Faire Pittsburgh website. Since 2015, we have increased the Faire from a Mini Maker Faire to a featured Maker Faire, with more partners and a greater variety of projects. Mobile MAKESHOP is a major initiative to create a strong educator-driven professional development experience to enable formal and informal educators to integrate open-ended, learning-rich making experiences into their schools, libraries, and community centers. This program aims to work with educators and learners in diverse formal and informal learning contexts to better understand how to authentically integrate making into such spaces and to address the unique needs of these diverse audiences. The Mobile MAKESHOP Program is made possible through the support of the Claude Worthington Benedum Foundation and has two main components: Partner Sites and Network Activities. For more information about how to get involved with the ongoing components of Mobile MAKESHOP, please check out the Educators & Profesisonals Resources page. Currently, in year two of the Mobile MAKESHOP program, the Children’s Museum has established partnerships with five regional educational organizations: Avonworth Elementary School, Crafton Elementary School, West Liberty University, Millvale Community Library, and the Children’s Museum of the Ohio Valley. Throughout the 2013-2014 school year , MAKESHOP Teaching Artists are working with educators and students from each organization through site-based residencies to create sustainable, scalable models for museum-community partnerships. Through their regular visits, and co-teaching along-side educators, the Teaching Artists have become members of the learning communities at each site. The Museum is working to foster a regional network of support, and communication, and socialization amongst formal and informal educators interested in incorporating making into diverse contexts of learning. Network activities include bi-monthly Maker Educator Meet-Ups for participants to discuss opportunities and challenges that this work presents, and to support one another’s efforts. These Meet-Ups take place at sites throughout the region where making is being thoughtfully integrated, including schools, libraries and museums. 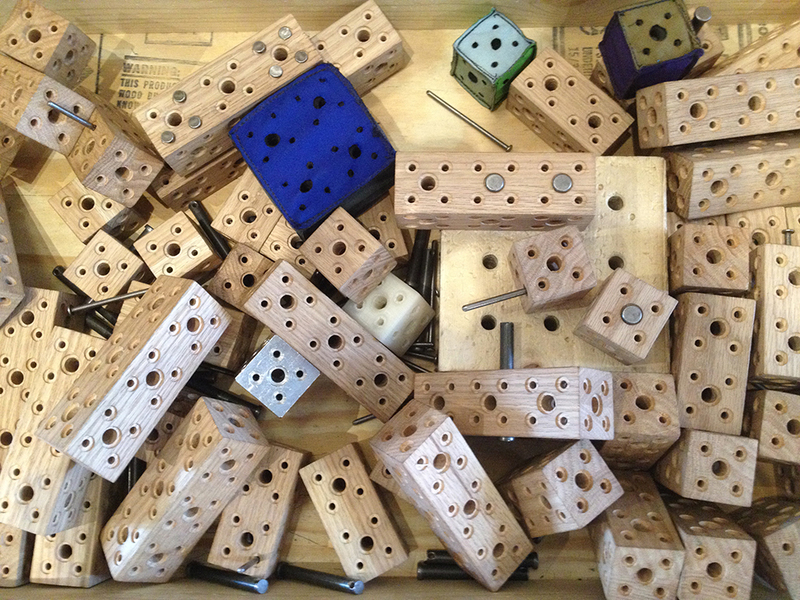 The Museum also annually hosts a Maker Educator Bootcamp. Through their participation in a week-long professional development experience, educators become familiar and comfortable with the materials, tools and processes of making, as well as brainstorm ways of incorporating making into their curricular repertoire. The majority educators who participated in 2013 summer felt as though the experience was “transformative” for themselves and their teaching. In addition, the Museum is currently developing a rich Resource Center through our MAKESHOP website that will be a place for educators and families to turn for inspiration, supply sources and recommendations, relevant research findings and to learn about upcoming MAKESHOP activities. The site will feature a blog for educators and network members to share ideas. Please refer to the Educators & Professionals Resources page for more information on school programs and partnerships.